Audi S8s, Shelby Mustangs, BMW M5s, Dodge Chargers and Honda S2000 roadsters are stolen thousands of times a year and yet people who own them are not required by government to be fingerprinted and photographed in order to sell their cars. Ditto folks who sell expensive items at pawn shops or on eBay. Can you imagine the chaos in commerce that would occur if every item over say $1,000 required the seller to surrender fingerprints and photographs – more accurately, mugshots – which the buyer would be obliged under penalty of law to submit to the state within 48 hours? Instead of reducing crime, the new law will instead put a damper on the sale of gold, silver and other precious metals. Jim Guidry notes that despite a claim made by Houston police, the precious metals industry will be hard pressed to comply with the turnaround demanded by the city, will balk at the prospect of alienating customers by demanding their fingerprints and mugshots, and the industry will ultimately suffer through loss of its customer base and through fines and criminal charges. Finally, it is hardly a secret that government hates the idea of citizens trading in gold and other precious metals. In 2009, the U.S. Mint made it more difficult to purchase gold and rationed the sale of American Gold Eagle coins and the previous year suspended the sale of American Buffalo 24-karat gold coins. Bernard von Nothaus of Liberty Dollar was prosecuted for daring to challenge the fiat money monopoly held by the Federal Reserve and the banks (and daring to have a political agenda, namely getting rid of a parasitical Federal Reserve). 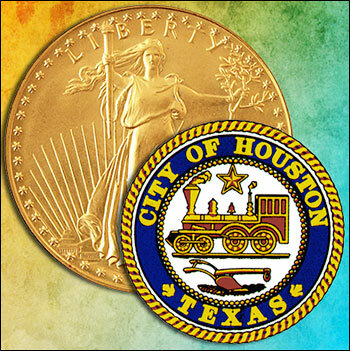 The City of Houston and its police, however, are not colluding with the Federal Reserve in an effort to control the sale of precious metals. The police are reacting as police always do – as gold and precious metals rise in value, it is quite natural that there is an increase in theft and fraud, a situation police react to quite naturally by demanding authoritarian laws that inevitably create a new class of criminals requiring more police and more prisons.